From Darwin, where we stayed for 6 weeks, to Yeppoon. 2976 km. Long stretches of nothing. Hot. Beautiful. We loved it. The endless road took us along dusty, red landscapes, plains of nothing, except for termite hills, birds of prey and kangaroos (sadly many of them dead … ). Driving south from Darwin we left the Stuart Highway at Tree Ways Roadhouse to take the Barkly Highway. 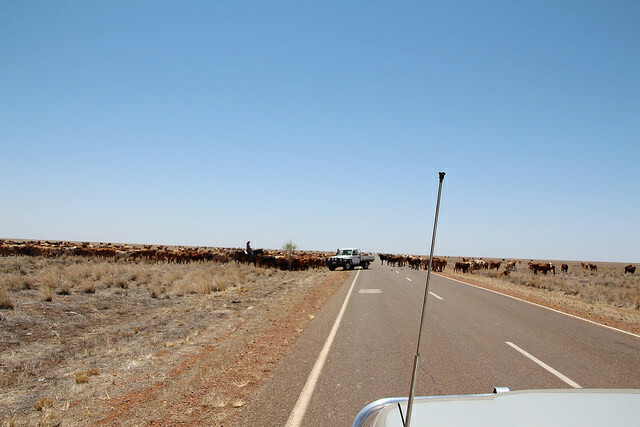 Just before the Queensland border, we had to stop in the middle of nowhere for hundreds of cows blocking the road. This is the land of the drovers! To be really part of it, you need a pair of boots and a cowboy head (by the way, don’t call them cowboys …). The first real town since Darwin is Mount Isa, the biggest town of Australia in surface. The chimneys of the mining industry define the landscape. Ore was discovered in 1923. Today copper, silver, zinc and lead are mined. Not the typical post card pictures, but the view has something about it. We wouldn’t stay here for longer than a few days though, wouldn’t call this a healthy environment … Once past Mount Isa, the road became less monotome, and we saw a few places of importance for the Australian history. 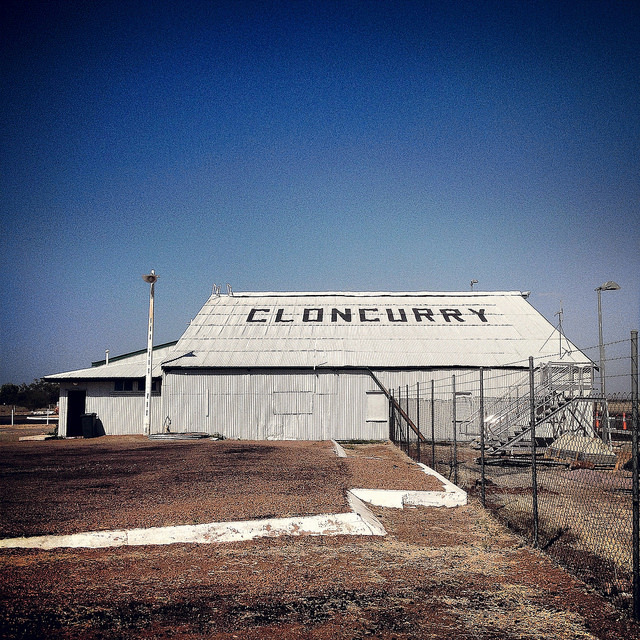 The Flying Doctors were founded in Cloncurry, a small place with some interesting sites. This is the place where the hottest temperature ever was measured in Australia, 53 °C … Lucky for us it was only 40 when we were there 🙂 This place has, not surprisingly, a mining history as well (copper). There are two foreign cemeteries, one for Chinese people and one for Afghani. The first arrived here with gold fever, and probably died of it, the latter had an important role organizing camel trains whilst there wasn’t a railway at the time. 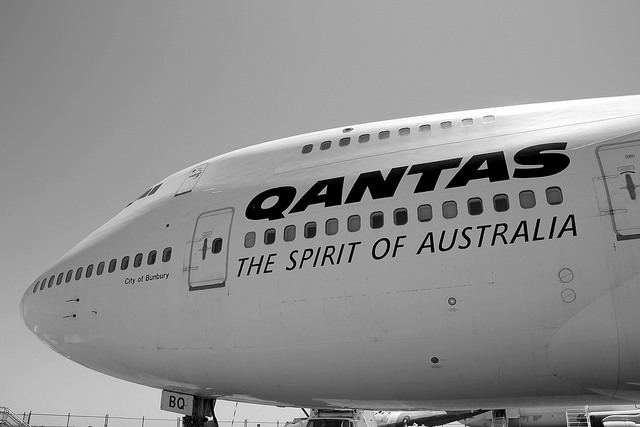 The first Qantas flight landed here, but the airline was founded jn Longreach (one of the planes still has this name). The road we followed, the Matilda (officially Landsborough) and Capricorn Highway, follows the Tropic all the way to Rockhampton. About 175 km further south, Longreach was the first town where we crossed the Tropic of Capricorn again, now in the opposite direction towards a temperate climate. Longreach is a lovely town. The Qantas Founders Outback Museum is well worth stopping, although we didn’t visit the museum but wandered around (the old airplanes are just outside J ). For Aussies the Stockman’s Hall of Fame is like a holy shrine, and tells the story of the outback in different galleries – from explorers over pastoralists till Aboriginal people. But what we liked most about Longreach? The bakery! We ate the best bread in months, and actually – except for the Turkish bread in Canberra – the best bread in Australia. The next place we crossed, was Barcaldine. Here the foundation was laid for the Labour Party. No big building to commemorate this important event, but a beautiful giant gum tree (died in 2006), the Tree of Knowledge. Travelling further East, there was always the company of the railway next to the road. There is a passenger train twice a week, but a lot more freight trains, most of them filled with coal and easily a kilometer long. But still, for us this felt like we were back in the ‘civilized’ world. We’ll leave it beside if this actually is a good thing or not. aussi highway from Travel for Motion on Vimeo. Barkly Highway from Travel for Motion on Vimeo.